These arc words perfectly capture the conflict at the heart of Incredibles 2, but they also sound kind of funny in 2018, a day and age when a new superhero movie seems to block off the sun every few months. They feel like words more suited for the movie landscape of a decade ago, when The Dark Knight and Iron Man were harbingers of a new blockbuster normal that had yet to come to fruition. In other words, they feel more descriptive of the world in which its predecessor The Incredibles was released, and that they manage to be so trenchant even today speaks to the sequel’s audacity in preoccupying itself with the same concerns it had a pop-culture eternity ago, and being so masterful as to make it seem like fourteen years was both far too long a time, and no time at all. Back in 2004, the superhero movie hadn’t yet become the all-consuming pop culture juggernaut it is today, with the most notable forays in the genre being fun, unpolished features that made bank but never felt calculated to do so. Nothing about the rogue, cult-ish charm of Spider-Man 2 or X2, two of the biggest superhero films of the pre-Marvel era, foreshadowed the sleek, chrome-plated monsters that would constitute the bulk of the genre a decade later. Contemplating the disconnect between that era and the era we live in today feels a lot like comparing the 2007 “We Believe” Golden State Warriors with today’s "Hampton's Five" Warriors. Your mileage may vary on which gave us more enjoyable moments, but we can all agree about the chasm-sized difference between them. 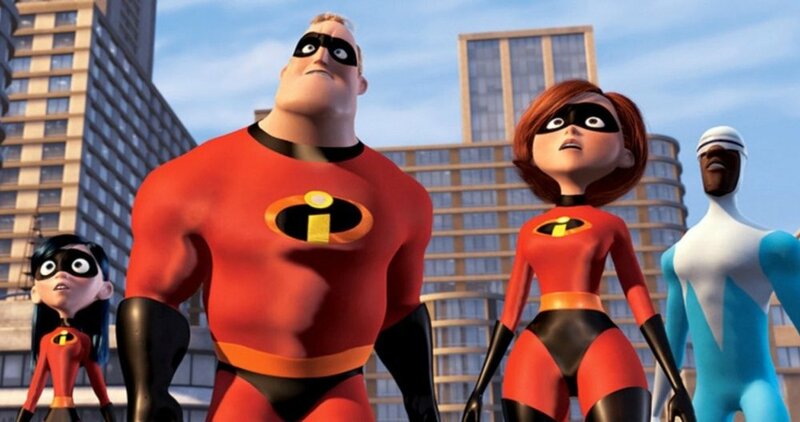 In that nascent, fragmented blockbuster landscape, Brad Bird’s The Incredibles felt like a revelation: The apotheosis of the superhero movie project to that point. At that point in time, it felt like a quantum leap in terms of how it built its universe, where there are not only superhumans but also ramifications to their existence, and there was a world that existed for purposes beyond the protagonists needing something to save. Even fourteen years on, you could argue that there are elements of the superhero project where The Incredibles has yet to be topped, such is its lasting brilliance. Even today, a film like The Incredibles would feel like a breath of fresh air—a visually distinct and intoxicating piece of comic-book cinema, as smart and thoughtful as it was pure, rollicking fun. In 2004, it was a game changer. But it isn’t 2004 anymore, and Incredibles 2 is not a game-changer, nor does it aspire to be. It announces itself as such from the opening minutes, where it picks up literally where it left off fourteen years ago, with the Underminer and Violet’s crush Tony, more concerned with its own philosophical and narrative baggage than it is with grappling with the modern state of the superhero movie, defiantly marching to the beat of its own drum. In a way, that makes it an appropriate antidote to today’s blockbuster landscape, as it is both wholly itself and cannot help but be informed by everything else that had happened in the interim. None of this would matter, of course, if the film weren’t as excellent in a vacuum as it is. It’s visually stunning, of course, in a way you’d forgotten superhero films could be. One of the film’s greatest assets is its unique aesthetic, a rich amalgam of 21st-century near-futurism and 1950’s Americana that gives the film a sense of being unstuck in time, unsure of whether it’s beholden to the past or the future or everything all at once. Each frame jitters with the alchemy of modern history happening all at once, a zeitgeist unstuck in time, the last sixty years of global tumult and societal change pinging off each other in the context of the film’s one-of-a-kind artistic ecosystem. This fundamental friction extends to the film’s characters, as both Mr. Incredible (Craig T. Nelson) and Elastigirl (Holly Hunter) struggle to balance their desire to relive their glory days and to build a better world for their children. “You have to do this,” Mr. Incredible tells his wife when she has reservations about industrialist Winston Deavor’s (Bob Odenkirk) plan to restore the legality of supers, “So our kids can have that choice. So I can have that choice.” Among its other achievements, Incredibles 2 might also be the best treatise on parenthood and middle-age we’ve seen in a blockbuster in a long time, as it captures so eloquently that odd push and pull between the past and future, that implacable angst of understand that part of self-actualization is participating in a world-building project whose fruit you won’t live to see. All that, and jokes too. The film isn’t perfect, as it suffers from a Pixar habit of bee-lining to the conclusion from the start of the third act instead of taking a bit more time to luxuriate, but any issue with it feels like nitpicking. It’s rare for a film to exceed the loftiest of expectations, but The Incredibles 2 is better than any of us could have expected it to be, simply by being nothing like what any of us saw coming. In a world where even the best superhero films pay only lip service to their supposed preoccupations, Brad Bird's sequel has the audacity to remain concerned with the same anxieties--legacy, irrelevance, and the double-edged promise of a new generation--it had in 2004, rightfully confident that, while everything has changed, not much really has. Aristotle once wrote that time crumbles things, and in a cultural landscape moving forward at warp speed, art fades and becomes more irrelevant by the hour. The myth makers of the entertainment industry, then, have to be continuously retooling and re-imagining their offerings in response to this accelerated product cycle, with a restless, targeted spirit of innovation that often makes the enterprise feel more corporate than creative, more Silicon Valley than Golden Age Hollywood. Everything is more reliably entertaining, but “reliably entertaining” doesn’t sound like a terribly exciting bar to hurdle. To borrow a turn of phrase from The Incredibles, when every film is super, it almost feels like none of them are. Thank the stars for Incredibles 2, then, which already feels like the most delightfully weird superhero movie we’ve gotten in a long while. To watch it is akin to putting on an old vinyl record after listening to a few mp3’s. Sure, the sound is fuzzier, but it feels more lived-in, more palpably human in its portrayal of a world with superheroes. Incredibles 2 succeeds because it combines the technical sleekness of modern superhero cinema with the more overtly ragged heart of its predecessors, creating a film whose few flaws somehow only serve to accentuate its daring, borderline maniacal brilliance even more. It’s easy to call Incredibles 2 a throwback, but that makes it sound as if it were beholden to some beat besides its own. Let’s call it what it is, then: Still timeless, after all these years.